Normally, I do not allow my children to have soft drinks. Occasionally, I will let them have a diet soft drink, just so it won’t be considered a forbidden fruit. But most of the time, they drink milk and water. Sometimes they have diluted fruit juice. Today, they asked if they could use their own money to buy a soft drink from a vending machine. So that’s what we did. I was shocked to see how much sugar was in there. 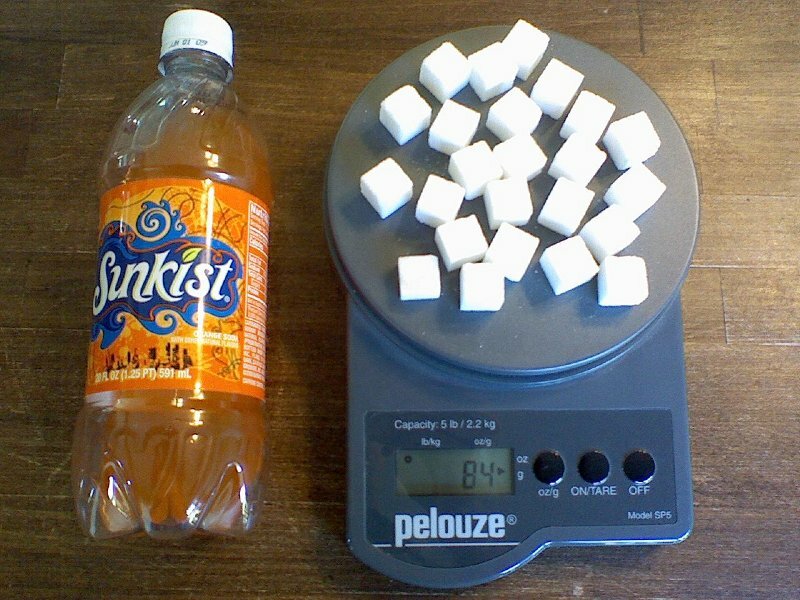 The label says that there is 34 grams of sugar per cup of Sunkist. And then it goes on to say that there are 2.5 cups in the bottle. Apparently, you are supposed to share this drink with 1.5 friends. So that means that one 20-ounce bottle contains 84 grams of sugar. That does not sound like much… after all, a gram is pretty small. You know, they measure stuff like medicine using grams, right? So we got out the postage scale and started stacking up sugar cubes until we had 84 grams. How many cubes would you guess? I would not have guessed it… 23 sugar cubes! Now imagine fixing yourself a cup of coffee and dropping 23 sugar cubes into the cup. Yuck!